Several things conspired to get me thinking about this “outdoor-connected kids” stuff. Part of it was talking with GrandHucklings about fishing and camping and hunting. Then there was Homey raving about his kid’s learning in the Kittitas Environmental Education Network (KEEN) Pond to Pines Summer Camp. Mostly, however, it was a new way of considering that moment when a child first sees him- or herself as an integral part of Earth, Nature, and the universe itself. Morris Uebelacker and I had pretty much wrapped up one of the final interviews for the book our Reecer Creek Publishing is doing on his life and successful struggle to overcome a brain injury, when arose the role of unconditional love. Morris spoke of his realization of the unlimited capacity of a fully opened heart – feeling and giving love without condition. We found ourselves remembering when we each first experienced that fully opening heart and instantaneous recognition of belonging to all of life. We spoke of friends who have identified and confided that moment. And of lifelong quests to recapture, maintain, or hold the feelings which buoyed us at the moment we recognized our capacity to unconditionally love – and be loved by – all of life and the universe itself. Interestingly, the moments we and others identified took place outside, on the ground, in the midst of some simple fishing, hunting or observing activity. And aren’t those moments the ones we talk about facilitating everytime we have these chats about getting kids connected? We can’t make the heart-opening moments, but we can create the space for them to occur. This is important stuff. Robert Pyle has long been recognized as one of America’s finest nature writers. From his popular books “The Thunder Tree, Lessons from an Urban Wildland” and “Butterflies of Cascadia” to “Sky Time in Gray’s River,” he has led a quest to understand our earth connections. In the long run, he says, estrangement from the natural world bodes ill for the earth, and we must become believers in the natural world to prevent the extinction of experience with wild things and places. Pyle often notes that connection happens at some specific place. It may be “a wilderness, a national park, or a stretch of unbounded countryside, but more often the place…is unspectacular: a vacant lot, a scruffy patch of woods, a weedy field, a stream…or a ditch.” Save wilderness, yes, but also save vacant lots, ditches and woodlots. These must be places where people don’t just tip‑toe through, but observe, feel, and interact in a way that touches and awakens the knowing within them. They must be places where kids might fish, or collect butterflies or touch snakes and insects; places where they will awaken to the knowing of safety and honorable responsibility within themselves. Maybe, too, these are places where kids’ hearts first open to unconditional love. We just have to get them to these places. Aldo Leopold (“A Sand County Almanac”) observed more than sixty years ago that he was unable to live without a connection to wild things. He implied that, while others may be able to live without it, he could not. How many of us today could live without the wildness flowing through our beautiful county? To me, it’s almost unthinkable. Yet, with rising human populations and shrinking wildness, a world without wild things is fact for many millions of people. Every day, various media make us witness to the devaluation of human life. More and more of our kids are learning to live without an earth connection. Regularly, we hear kids expressing a sense of fear in their lives. Writers and naturalists have long held that it is only through a sense of belonging to earth and wild things that we experience the natural rhythms of life and death. To them, it is only through some hands on connection that we develop a true sense of responsibility to ourselves and others. Storyteller Valerie Martin says it simply: in the end, only nature can restore our sense of safety. This is the ideal season to get our youngsters on the ground and into nature. Get them out there, and they will find for themselves that heart-opening moment. This is important. To paraphrase Jodi Larsen, Upper Kittitas County Rotary: Children are the emissaries we send into a time we will never see – what do we want them to take along? You have heard, no doubt, about the plans for the mountain goats in the Olympic National Park and on the Olympic Peninsula of Washington State. Mountain goats are, arguably, our most unique large mammal. I’m always surprised when people who love our back country know so little about them. Given my role as chair of the Wildlife Education Committee of the Reecer Creek Rod, Gun, Working Dog & Outdoor Think Tank Benevolent Association, and governed by our bylaws, I am sworn to answer all inquiries. Herewith, my response to Homey – and then some. 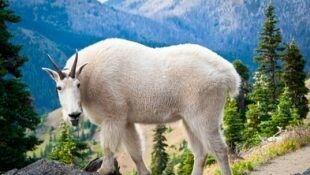 Mountain goat’s scientific name is Oreamnos americanus. Not a true goat, it is most closely related to the chamois of the European Alps and some African antelope. It acts like a goat on rocky outcroppings, cliffs and alpine tundra in some of the most remote high country of North America, so the name sticks. A large billy may be three feet at the shoulder, five feet long, and weigh three hundred pounds. A nanny may reach a bit over half that weight. Their shaggy white hair and shoulder hump may be why they were often called “white buffalo” by Native Americans and early European settlers. Shed hair may be found all over goat habitat all summer long, and is often woven into warm blankets and garments by collectors. Mountain goats, it is said, live one step below the sky. There, they feed on low grasses, sedges, mosses and willow shoots. Their black hooves have concave rubbery pads surrounded with sharp, hard edges, enabling them to keep solid footing even on near-vertical cliffs. An amazing sense of balance, powerful hind legs, and forequarters strong enough to lift them to a higher ledge make their climbing legendary. Mating takes place in November and December, and one or two six-pound kids will arrive in May or June. An eagle may occasionally take a kid, but few other predators bother them. They rarely move lower in winter, and icy snows and hundred-mile-an-hour winds threaten their survival. Even the best of feet may fail on ice, and freeze-thaw action will loosen benches and ledges. Many goats have scars or broken horns, proving survival ability, and it is not uncommon for several animals to perish in the misjudged crossing of an avalanche chute. The mountain goat is native to the Cascade Mountains of Washington, but not native to the Olympic Mountains, where it was transplanted in the 1920s. Unfortunately, the Olympics lack a key set of nutrients goats need, and their constant search for it among humans has led to their long-held “pest” status. In the 1980s, their numbers surpassed 1,000. While hundreds of them were moved out of the national park, numbers stayed high, and biologists think there may now be as many as 725 goats in the national park and the adjacent national forest (somewhere around 3,000 goats live in Washington State). A new plan for the Olympic goats was released in May. Because goats crave salt – not naturally occurring on the peninsula – they seek it and other minerals along trails and in wilderness campsites where they find them in people’s urine, packs, sweaty clothing, and places where cooking water has been dumped. The goats’ need for access to trails and campsites has led to a lack of fear of humans – that pest status – and was likely a factor in the 2010 death of a park visitor gored by a large billy. Under the plan released in May – a coordinated effort of the National Park Service, US Forest Service, and the Washington Department of Fish and Wildlife – all Olympic Peninsula goats will get one-way tickets to the North Cascade Mountains, to supplement native populations there. Using helicopters, during two-week summer periods, the mountain goats will be moved over the next three to five years. Any goats remaining after all capture efforts will be shot and killed. Until the removal is completed, you may still find goats in the Olympics; check out the cliffs on Mount Ellinor, out of Hoodsport. Our Washington State Cascade Range goats are wild and watchable. Head up to the Sunrise Visitor center in Mount Rainier National Park and look around. Closer to our Central Washington home, drive up to the Timberwolf Mountain fire lookout, off the Bethel Ridge Road from Highway 12, and look around. You’ll see them along Lake Chelan, as you boat up to Stehekin. Kachess Ridge works, and I always see goats on the cliffs of Mount Si, out of North Bend. If you’re looking for a mini-vacation, head for Flume Creek Mountain Goat Viewing Area out of Metaline, northeast of Kettle Falls, where you may also see moose, bighorns and (maybe) woodland caribou. For a great read, get Chadwick’s A Beast the Color of Winter. For your trip, pick up a copy of the Washington Wildlife Viewing Guide at a local bookstore or online. Grab your binoculars and spotting scope and go. It’s High Country goat watching time. A decade or so ago, I spent a night along the Klickitat River, in south-central Washington. At some point during during the last couple hours of evening – lost in the roar and peace of the upper Klickitat, and thinking spring Chinook salmon – I became aware of something moving through the darkness around me. When I paused long enough for a good skyward look toward the brighter west, I recognized the little brown bat so common in our country, along with a couple bigger silver-haired bats, and maybe even a long-winged hoary bat or two. That rekindled my “evening watch” interest. This week, Homey reminded me that we have a lot of young families in Central Washington with evening activity needs. “So,” he challenged, “why aren’t you writing about our bats and where to go watch them?” Okay… Fine. We are bat blessed. Among at least fifteen species, perhaps millions of bats inhabit Washington State. Most live without human contact, spending days in caves, crevices and behind loose tree bark, house siding and shutters. After spring breeding, males and females separate. By now, one or two babies may be nursing on the wing while clinging to mother. Most will be flying in a month. Genus Myotis (the little brown) is most common, with Lasiurus (hoary) and Lasionycteris (silver-haired) often seen in wooded country. Bats are at home across the state. Most of ours hibernate here, but some fly south with the hoary bat to Chile or Argentina. They are all insect eaters, of the Vespertilionid family. Among our best friends, a little brown bat will eat 3,000 mosquitoes in an evening. A flock of 100,000 bats (not uncommon) may consume more than a ton of insects in the same time period. Bats sometimes fly into gatherings of insects, crippling them with their wings and scooping them into folds between their legs to be consumed as they continue to hunt. You may have heard that bats don’t really fly – they just glide. Not so. Bats are skillful flyers, often hitting 40 miles per hour for short spurts, skimming low over ground or water to catch insects and drink. Our common little brown may travel 50 miles in a night of foraging. Wingspans for their tissue-thin wings (attached along sides and back legs) are commonly three times or more their average four-inch body length – a ratio greater than most birds. Most varieties have wingspans of 10 to 12 inches; our largest bats may reach six inches, with wingspans of 16 inches. Wings and bodies weigh far, far less than you might suspect; the tiny western pipistrelle, Pipistrellus hesperus, is three inches long, but weighs only 1/10th of an ounce (more than a penny, but half of a quarter), and our little brown bat, Myotis lucifugus, is three and a half inches long, weighing well under an ounce (maybe three or four quarters). These flying mammals have long been in human consciousness. In European folklore, bat is often a sinister beast, but the Aztecs, Toltecs, Mayans and other ancients treasured the bat. Its upside-down hanging was likened to an unborn child, and its medicine – teaching – was of spiritual rebirth, the giving up of old ways of being. Find treasure troves of bat information and status for all bat species at Bat Conservation International (www.batcon.org/). Closer to home, check our the work and meetings of Bats Northwest, headquartered in Seattle. They have regular bat-watching tours around Green Lake and a web page (www.batsnorthwest.org/meet_our_bats.html) with a wealth of information about the status and health of our Northwest bat populations. Now then, about Homey’s request. I like the beaver ponds up French Cabin Creek and along the hills on the west side of Lake Cle Elum, but pick most any pond, stream or arm of a lake (less than 100 feet across) in Paradise. Sit on the east side at dusk, and watch the bright western sky over the water until full darkness. Use insect repellent. Go watch (take a field guide, too). You will soon differentiate species based on ways of flying, hunting and drinking. Some may sing their songs of evening for you. Late last fall, we talked about the Washington Department of Fish and Wildlife (DFW) and its Youth Outdoors Initiative – a part of DFW’s R3 (recruitment, retention and reactivation) Initiative. This is all a response to slumping numbers of hunters nationwide and here in Paradise. Over the last decade, some 17,748 hunters have stopped buying hunting licenses in our state – the $40 million or so that they did not spend as hunters carries a big impact, especially to our wildlife and outdoor heritage. The Youth Outdoors Initiative is one way of getting youngsters off their digital addictions and into various outdoor activities – some of which may address those hunter numbers. Recruitment of hunters has fallen largely into the hands of DFW’s regional Hunter Education & Volunteer coordinators, such as our Region 3 guy, Aaron Garcia. You are aware that Aaron has ramrodded several events with a variety of partners already – turkey hunting clinics, mentored turkey hunts for first-time hunters, pheasant hunts and more. Next Saturday, 10 – 2, a Free Youth Outreach Event happens at co-sponsor Cascade Field and Stream’s shooting range on Hayward Hill. It will include shotgun, small and large rifle training and shooting, upland bird and wild turkey hunting clinics, survival information, and firearm safety instruction. Among the other partners at this event are Pheasants Forever and National Wild Turkey Federation. A major new partner with DFW is the First Hunt Foundation. First hunts are never-forgotten milestones. I still feel the excitement of the first time The Old Man decided I could carry his slug-loaded shotgun on a deer hunt at Uncle Ed’s place up the Little Chumstick, out of Leavenworth, Washington, at the east base of the Cascades. Daughter Michelle and her first Wyoming antelope are fresh in my mind; after a long crawling stalk, a deep focus and a perfect shot, I patted her shoulder and said “Good shot!” She looked at me, quizzically. “Did the rifle go off?” Son Tim made a perfect shot on a big southern Colorado muley doe, and couldn’t believe that his practice and training really worked. Edward, on the last day of our Wyoming hunt following the terrible events of 9/11, prayed an antelope into perfect range. These are the first hunts on which family traditions of hunting and gathering are built. Those of us regularly having “hunting” discussions are finding more and more youngsters – and adults – wanting to learn shooting and hunting and the care of game which they might contribute to family larders. One or two at a time, we train and help out where we can, but in 2015 Rick Brazell, of Kamiah, Idaho, had a better idea. Retired from a long US Forest Service career as a biologist, Rick opted to make a bigger difference: his brainchild is The 501 (c)(3) non-profit First Hunt Foundation (FHF). FHF has a simple mission: “The First Hunt Foundation is dedicated to insure hunting remains a vital part of the American culture. We believe that by providing a mentor based hunting experience to youth and other interested individuals, the hunting heritage will be passed on to future generations. Wildlife conservation and habitat management will be better served and supported by having citizens who are educated on the value of hunting as a management tool.” FHF leaders intend to create thousands of first hunts, thus creating future hunters, community leaders, voters and elected officials who will support hunting as a valid part of the American culture now and into the future. FHF relies entirely on volunteers, donating their own time and resources. Donate they have. As of this week, The foundation has at least 135 background-checked mentors in 14 states, including Washington, (with Texas next in line). In 2017, those mentors managed more than 1900 mentored days with new shooters and first-time hunters. The goal is to have a mentor program in every state that offers hunting opportunities, with thousands of mentors taking youth out each year on all hunts allowed by state laws. There are three programs within The Foundation. The Mentoring Program involves members of First Hunt Foundation Chapters across the U.S. which are linked through insurance and associated with Outdoor Mentors – Pass it On. The second program is The New Hunter Shooting and Education Progam, teaching wildlife conservation, pre-hunt preparation and post-hunt meat processing. Here, mentors work alongside youth and others on proper shooting techniques and gun safety. Number three is the Hunter Appreciation Program which awards certificates of appreciation to successful first time hunters, as a way of congratulating them for choosing to be a hunter and successfully completing a milestone in their hopefully long hunting career. Certificates are species-specific, so no matter the harvest, the hunter is celebrated. FHF is rapidly growing partnerships and activities. Check it out at www.firsthuntfoundation.org/, or contact Rick Brazell at rickb@firsthuntfoundation.org or 208-935-9133. Come to the Youth Outreach Event next Saturday at the range on Hayward Hill off US 97 from 10 til 2. See for yourself how our traditions and future are being secured. This is important. To paraphrase Jodi Larsen, Upper County Rotary: Children are the emissaries we send into a time we will never see – what do we want them to take along?